Daily Oral Language Sentences for First Grade FREEBIE! This sample set of D.O.L. sentences is just right for first grade! 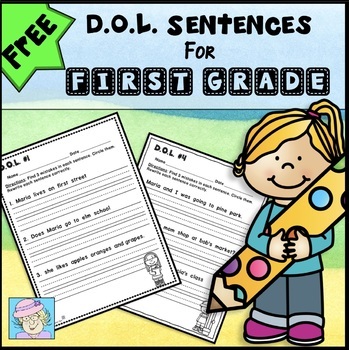 It has 5 pages with 3 sentences on each page, for a total of 15 sentences to correct! Students will identify 3 errors in each sentence. Then, they will rewrite each sentence correctly. Errors in punctuation, capitals, spelling, and verb tense are included. CLICK HERE TO VIEW THE PRICED, 50-PAGE SET!